With 127 miles of coastline, New Jersey Lighthouses have played a significant role in maritime history in aiding the safe navigation of ships since the 1700's. New Jersey has ten original (non-replica) lighthouses that are open the to public and several still in operation. The lighthouses open to the public have been transformed into museums or education centers in celebration of the state's rich maritime heritage. Aside from their place in maritime history, the added appeal of New Jersey lighthouses has to do with their architectural design and location in some of the most scenic and relaxing settings with oceanfront views and sandy beaches. New Jersey lighthouses have served mariners along the Jersey shoreline for over a century, warning them of hazards to their ships and the protection of loss of crew and cargo. The endurance of these maritime structures is a tribute to the innovative architecture and engineering that contributes greatly to maritime history in New Jersey. 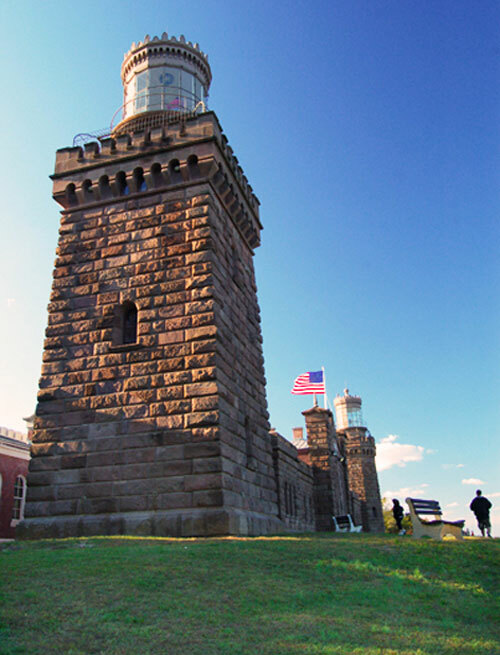 New Jersey is home to many of the oldest and historically significant lighthouses in the nation. 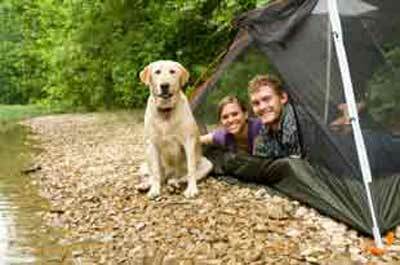 They can be found along the 127 mile coastline from the northernmost point in Sandy Hook down to the southern tip of in Cape May. 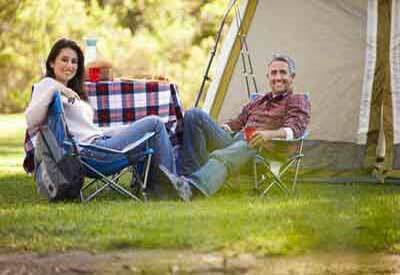 New Jersey lighthouses can be seen in a variety of settings and in the serenity of the landscape that surrounds them. The scenic beauty of a lighthouse takes on a different backdrop depending on the time of day it's viewed. 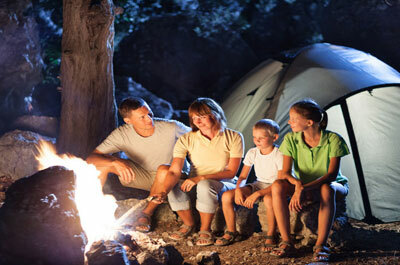 With the sun and moon rising over the ocean, sunrise and a full moon are especially appealing times to view a lighthouse either by taking a walk along the beach, or relaxing and picnicking in a beach chair or blanket. For the more active, take a hike up the steps of a lighthouse and experience the magnificent views and skylines that surround it. The lighthouses were built to survive the treacherous coastline hurricanes and storms and yet their structures came to be known as significant maritime historical sites and beautiful scenic landmarks. Lighthouses come in all shapes and sizes. In addition to the popular tall conical shape structures, New Jersey has a lighthouse with twin brownstone towers in the Atlantic Highlands that resembles the front of a military fort, and a lighthouse in Sea Girt that has the style of a Victorian home, and a lighthouse in Hereford Inlet with Swiss Gothic-style architecture and a tower attached to its roof. The maritime history of lighthouses in New Jersey is deep and storied, beginning with the opening of the Sandy Hook Lightship in 1823, becoming the first outside lightship in the United states. Not to be forgotten are the heroic stories associated with lighthouses. They are the keepers of a harbor, beacons during stormy nights, and the providers of direction to those off course. During World War II, the beacons of New Jersey lighthouses were turned off so as not to give direction to enemy ships. But the Coast Guard used many of the lighthouses as bases for beach patrols in search of German U-boats. With the development of automated navigational equipment, offshore navigational towers, radar, and other advanced navigational equipment, the 20th century began the phase out of manned lighthouses. While there are still working lighthouses in New Jersey, most have been decommissioned. The Absecon lighthouse is New Jersey's tallest and one of the nations oldest lighthouses is located in the northern tip of Atlantic City. Climb the 228 steps and take in an amazing experience as you view the Jersey Shore and the Atlantic City skyline from a perch that is breathtaking. 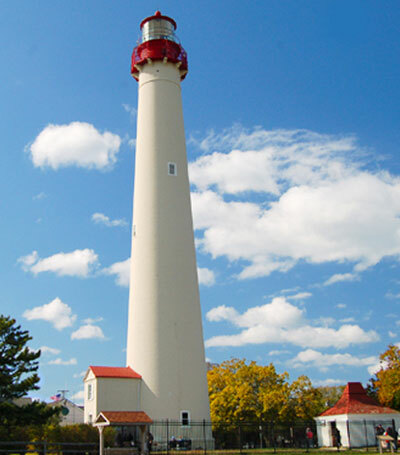 Barnegat Lighthouse is the second tallest lighthouse in the United States. 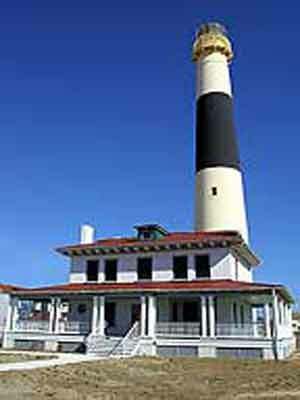 The lighthouse is the featured attraction of a beautiful State Park that is popular with fishermen. 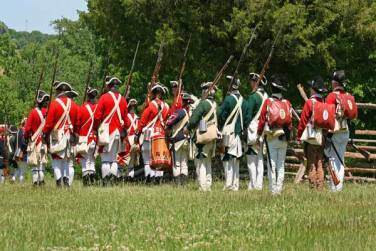 It is operated as an historical Museum with exhibits featuring the original light and other artifacts. 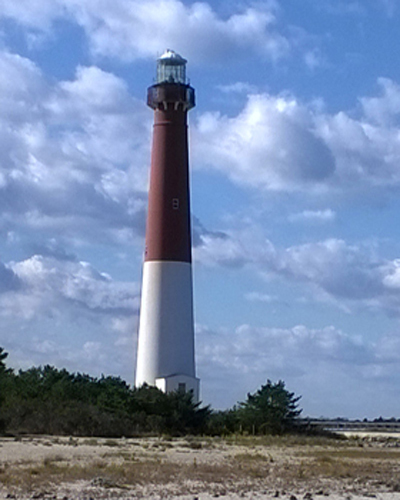 Visitors are able to climb the 217 steps to the light keeper's catwalk to experience a magnificent view of Island Beach State Park, Barnegat Bay, and Long Beach Island. Cape May Lighthouse is one of the oldest operating lighthouses in the United States and is located on the southernmost tip of New Jersey. Climb up the winding 199 stairs to the top of the 157 foot-tall structure and from the watch gallery take in a fantastic view the Atlantic ocean, the town of Cape May, Delaware Bay, and Cape May Point State Park. The Hereford Inlet Lighthouse in North Wildwood, NJ, built in 1874, is a unique historic and picturesque lighthouse and the only one of this style on the east coast. Now owned by the town of North Wildwood, it has reopened to public tours of the light and its extensive gardens. Navesink Twin Lights Lighthouse is located 200 feet above sea level in Highlands, New Jersey, overlooking the Shrewsbury River, Sandy Hook, Raritan Bay, New York skyline and the Atlantic Ocean. The lighthouse is maintained as a museum for public viewing. The north light tower can be climbed to see the panoramic view of the New York Skyline and the southern end of New York Harbor. 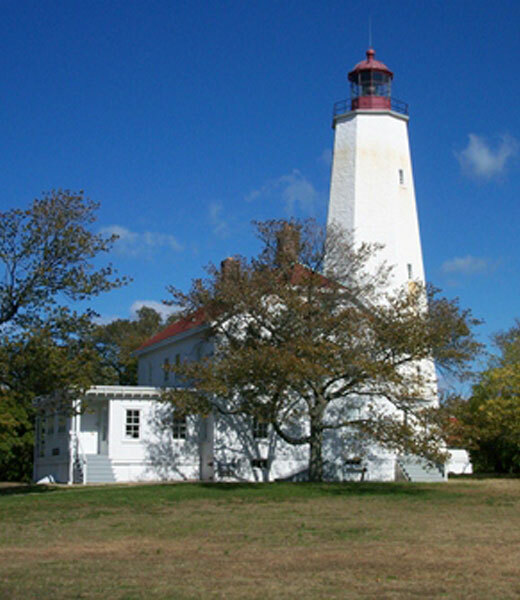 The Sandy Hook Lighthouse, located on the the tip of Sandy Hook, NJ, at the entrance of New York Harbor, is the oldest working lighthouse in the country. The light is maintained by the United States Coast Guard and is lit 24 hours a day. 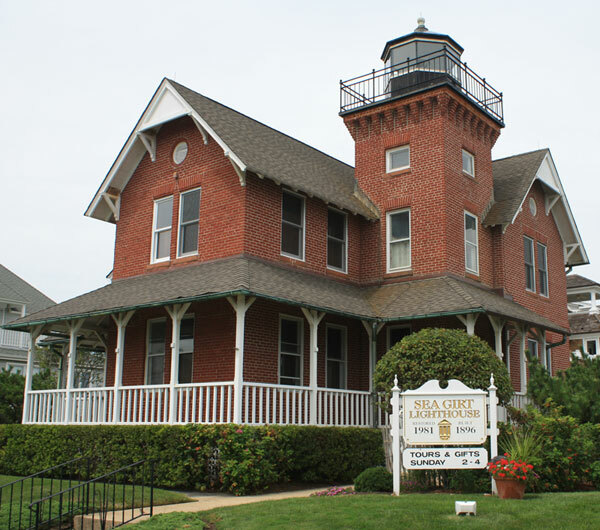 The Sea Girt lighthouse is the last live-in lighthouse built in the United States. 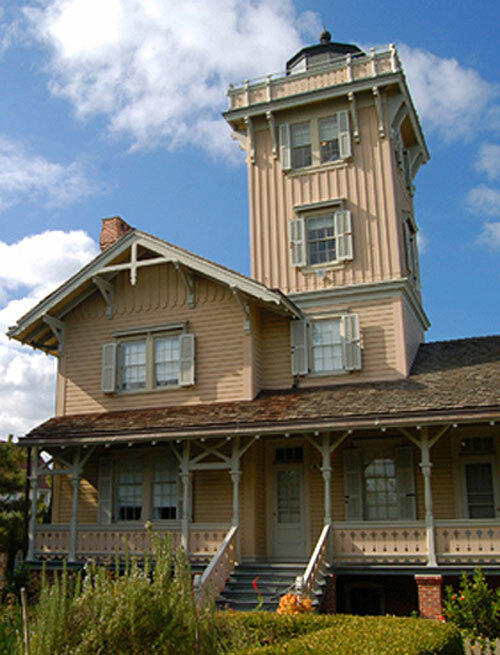 The lighthouse tower is attached to the building where the lighthouse keeper and his family lived. Guided tours and exhibits of rare photos and artifacts are on display, including a Fresnel lens, similar to the original fourth order lens used in the tower. 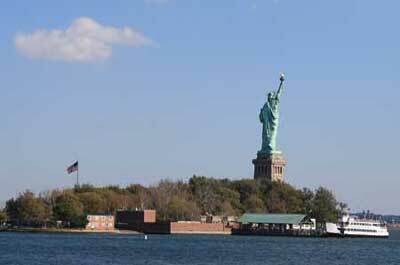 The Statue of Liberty is both a National Monument and a former Lighthouse. The Statue of Liberty functioned as a lighthouse from 1886 to 1902, after being accepted by Congress as a gift from France 1877. 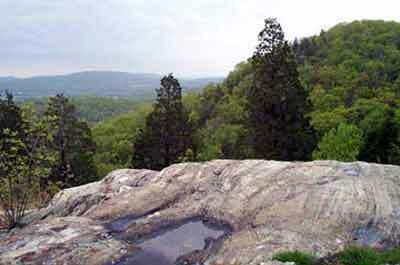 As with all historic areas administered by the National Park Service, the monument is listed on the National Register of Historic Places. Today, visitors to Liberty Island can learn more about the old Liberty Lighthouse from park rangers. The Tinicum Island Range Lighthouse overlooking the Delaware River in Paulsboro, NJ, was built in 1880 and still functions as an operational lighthouse. 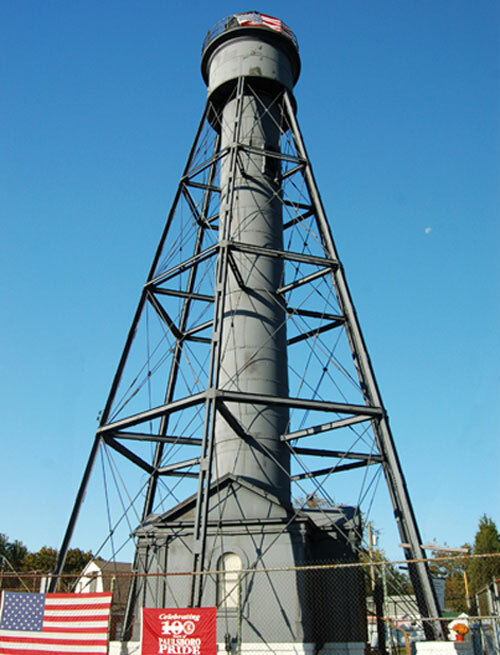 The Tinicum Rear Range Light Society maintains the lighthouse and offers access to the public.